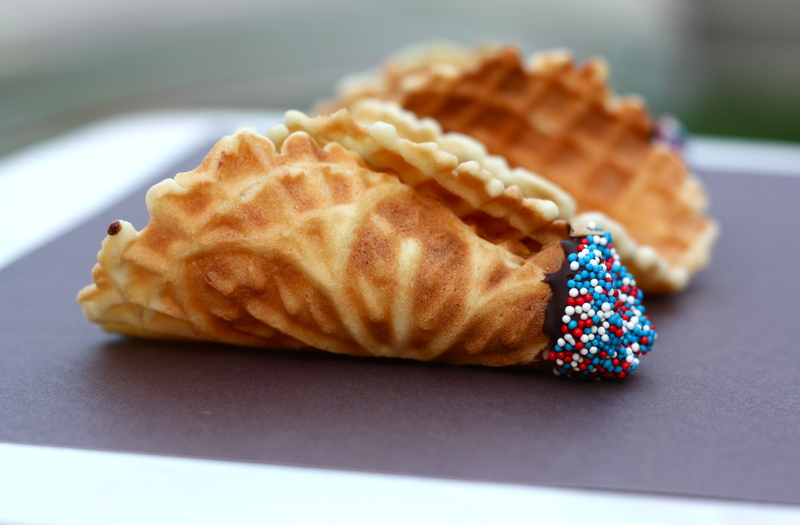 I’ve been wanting to try making my own cones with my pizzelle maker, and with the aid and excitement of a great friend, I finally gave it a go. Super fun! 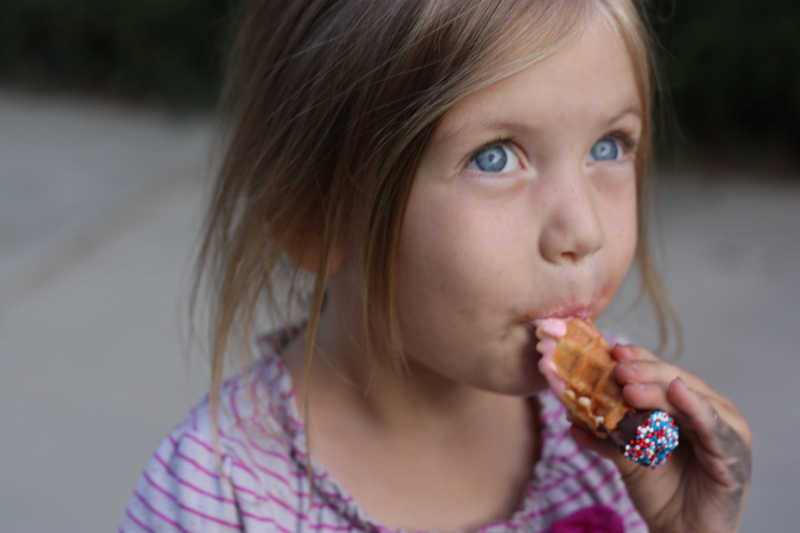 The cones were small, and I couldn’t quite get the bottom to close, so I had to dip them in chocolate (darnit!). But they were actually the perfect size for one scoop of ice cream, and I can’t wait to try them again, and even trying some different mix-ins, like perhaps lemon zest? If you got lost at pizzelle maker, here’s a link to amazon‘s sampling of choices–they are great for Christmas cookies! I got this recipe from The Perfect Scoop by David Lebovitz. 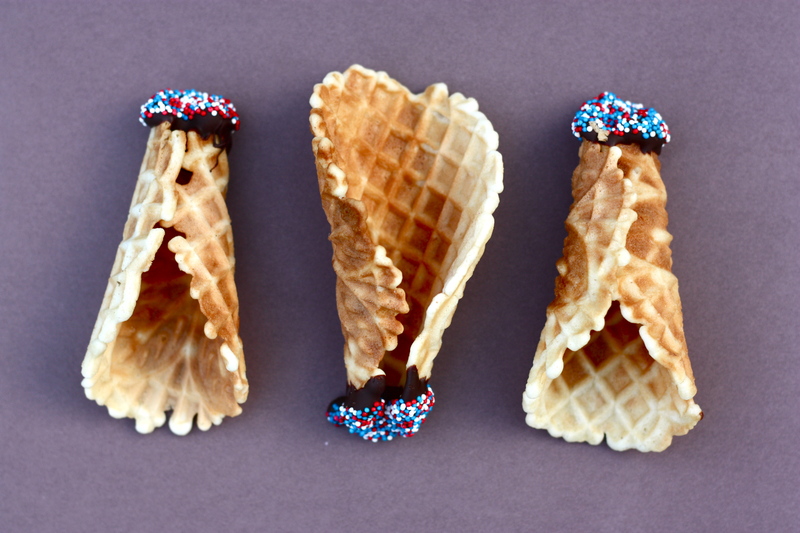 Plug in and turn on your waffle cone or pizzelle maker. In a small mixing bowl, stir together the egg whites, sugar, and vanilla. Stir in the salt and half of the flour, then mix in the melted butter. Beat in the rest of the flour until smooth. If you want to bake these in an oven (it seems a little complicated to me), here’s the epicurious link. Otherwise, fill each mold in your cone or pizzelle maker with about 1 1/2 T. batter, and bake for about 1 minute. Remove cookie and immediately shape around your fingers or in a ramekin (for more of a seashell). You may want to use a tea towell or gloves ’cause these are hot!! Enjoy! I doubled the recipe and it yielded about 20 in a pizzelle maker. My cute four-year-old loving it! For Sesame or Poppy Seed Ice Cream Cones, stir 3 tablespoons (35 g) toasted sesame or poppy seeds and a bit of grated lemon zest into the batter. To make Chocolate Ice Cream Cones, increase the sugar to 1/2 cup (100 g), and use 6 tablespoons (60 g) flour and 3 tablespoons (21 g) unsweetened Dutch-process cocoa powder in place of the 2/3 cup (90 g) flour. For Gingersnap Ice Cream Cones, add 1 tablespoon mild molasses and 1/4 teaspoon each ground cinnamon, ginger, and nutmeg to the batter. Increase the sugar to 1/2 cup (100 g). For Honey-Cornmeal Ice Cream Cones, substitute 1 large egg and 1 egg white for the 1/4 cup (60 ml) egg whites. Melt 2 teaspoons of strongly flavored honey with the butter, and substitute 1/2 cup (70 g) of flour and 1/4 cup (35 g) of stone-ground cornmeal for the 2/3 cup (90 g) flour. For Rosemary Ice Cream Cones, add 2 teaspoons finely chopped fresh rosemary to the Honey-Cornmeal Ice Cream Cone batter.